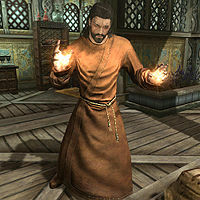 Acolyte Jenssen is a Nord priest at the Temple of Kynareth in Whiterun. He spends his entire life inside the temple, tending to the sick and injured by using his restore health and stamina spells to effectively cure them. From midnight to 8am he sleeps in one of the available beds. If Whiterun is attacked as part of the civil war, Jenssen will make an exception and help repair the temple walls, going outside at 1pm and spend three hours using his hammer on the wall near the entrance. He wears a set of monk robes with a pair of boots, and carries the key to Wintersand Manor along with a selection of lower-class items and gold. He doesn't wield any weapons and instead relies on a selection of spells, specifically Healing, Sparks, Lightning Bolt and Oakflesh. While healing his patients, he will also reassure them from time to time, saying comforting things such as "Patience. The body needs time to mend. ", "More rest will do you good. ", and "Try to relax. You'll be well soon enough." He shares these lines with his fellow healers, Ahlam and Danica Pure-Spring. He carries the key to Wintersand Manor, but there is no such place to be found in Skyrim. This page was last modified on 29 December 2013, at 19:04.